Diary of an Aspiring Loser: She Looks Amazing! It's Friday and I'm home with a sick kid. Perfect time to do some blogging, right? I'll jump back to Wednesday, my day home with the kids. We spent the morning enjoying some fine Northern California weather. I packed up a picnic and met some super-cool mom friends for a kid-friendly hike (Hi Whit, Joanna and Erin!!). There were 4 of us with two kids each - plus a dog - keeping us all busy. After the hike we staked out a spot in the grass for a picnic. I'd made myself a chicken avocado sandwich with lettuce, tomato and mustard. Yummy! 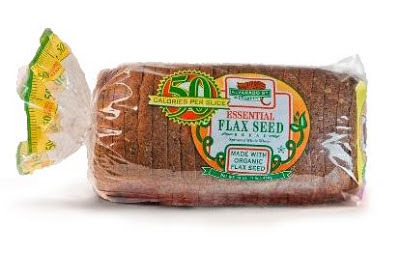 I'm still using the Essential Flax Seed bread from Alvarado Bakery. 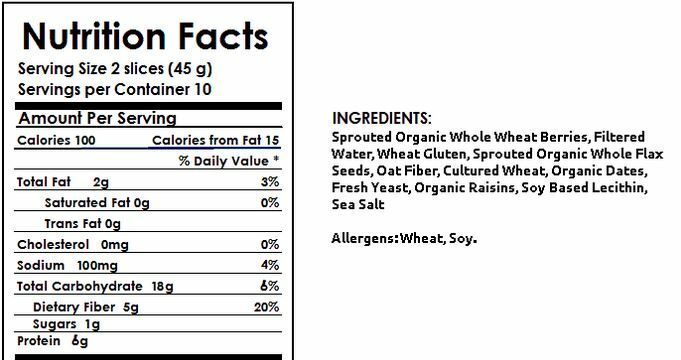 Notice the serving size is *2* slices - and check out the protein and fiber! I usually lightly toast the bread for sandwiches - it adds a nice crunch - but since this would be packed up for a picnic I left it soft. So I had the sandwich and fruit for lunch. There's a small organic farm stand near where we hiked and I purchased some strawberries that were amazing! After the hike we took the kids for ice cream. 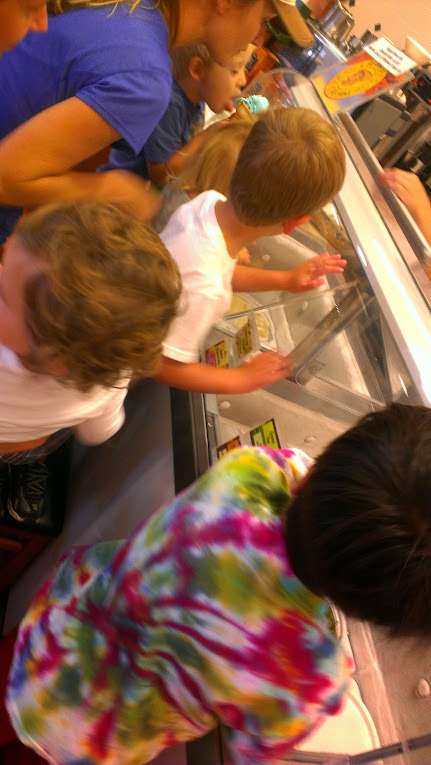 The kids all standing on chairs to scope out the ice cream flavors - so cute! I had a large hot tea and only snuck a few bites of the kids' ice cream (and a few bites of the yummy cookie samples they had on the counter). I was not tempted at all to have my own ice cream. Motivation makes everything easier. Too bad it doesn't stick around 100% all the time, but as they say, if it were easy, everybody would do it, right? After the hike I came home and quickly changed for the gym. You might remember I wasn't able to go on Tuesday so I was happy to get in a make-up session. But by the time I got to the gym I was pressed for time. I started with a 3-mile treadmill run and then flew through my chest/shoulders/core routine. I felt a bit spazzy, quickly hopping from one exercise to the next and almost running circles around my fellow gym-goers. I felt compelled to tell the woman near me that I was running late and that I'm normally not quite so spastic. The interesting thing was that I burned more calories than I usually do, and in less time. Goes to show that intensity trumps time when it comes to burning calories. After the gym I changed and went to my private practice. I knew I'd be starving before too long so I bought a snack-bar at the gym and ate half of that, along with the rest of my tea, on the way to the office. Then home to make dinner. Miguel and I had grilled steaks and rice, the kids had some homemade pizzas I whipped up. No veggies in site. Then I hit the grocery store for some much needed food - including some veggies. Whew, that was a long day! Yesterday was a bit more normal. The highlight was lunch with some super-cool fitness friends - Mira and Cori (Hi ladies!!). They are both on this wonderful journey of health, fitness, and self-discovery. Being women of a certain age, and mothers, we share in the insanity and joys of weight loss (and maintenance). It's always good to be reminded that we're not alone on this wild ride. Even if you can't see anyone else on the road - knowing others are out there, fighting the good fight, and we're all cheering each other on - it's good stuff. I hit the gym after work, feeling ready to burn off some energy. Spin class was starting just as I got there so I quickly changed and joined in late. Mark was there and you know he's blogging now so I landed in his blog! Michelle (our club superhero) came into the class just after it started. She walked across the floor and I couldn't help but think to myself, my God, she looks amazing! There were a few times that I glanced over at her and was simply awe struck at how much she has transformed her body. As she rode I could see how well her arms and legs have become defined. No one would ever know that this woman had once carried an excess of 90 pounds on her body. So much here that puts a big smile on my face. Thank you Mark for being such a positive reinforcement in my journey. And the thought that I've done the same for you is so perfect. Dear readers, bear with the love fest. I only had time for my normal 25 minutes so I left spin class early, despite a real desire to stay and revel in the music, in my pumped up heart rate, and in the energy in the room. After spin I did legs/shoulders/core, taking it a tad easier on my back when it came to core exercises. Oy vey, my back...[so I *just* took a break from writing to schedule an appointment with the doctor. They have an opening on Monday so I might be going to physical therapy by this time next week! Not a moment too soon, I've started popping the ibuprofen twice a day.] As I was heading out the door Mark and I had a chance to chat. I grilled him a bit on his post-30-day-Paleo cleanse plan. I remember from Body for Life that doing a time-limited plan is great as a kick-start but it makes having a good plan for transition super-important. Anyway, I went to pick up the kids and turns out Marek had thrown up his afternoon snack and since preschool rules means he has to stay home today, I'm here scheming to get to the gym later. The good news my bug's bug seems to have already passed - so far everything he's eating is staying down. 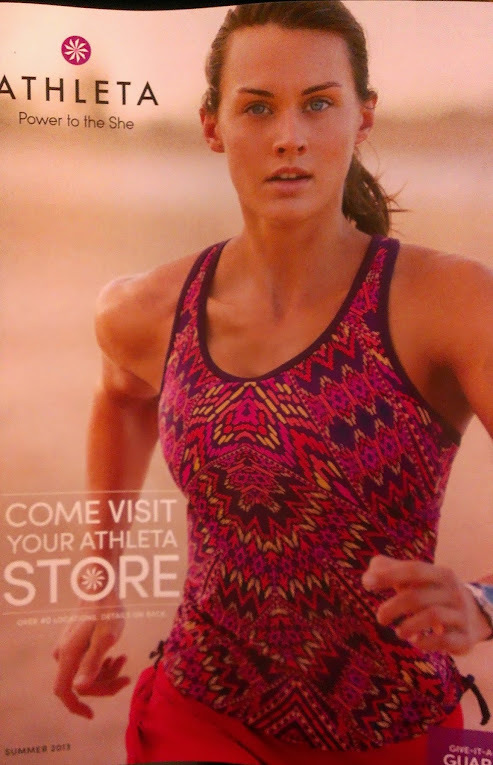 I'll close with a little inspiration via the Athleta catalog. Check out those shoulders!! I just wanted to say that I have just discovered your blog and stayed up late reading many of your previous posts. I am struggling quite a bit at the moment so it's been really helpful and inspiring to read your posts. Your blog is definitely a favourite! I think it's great that you choose to do active things with your children!